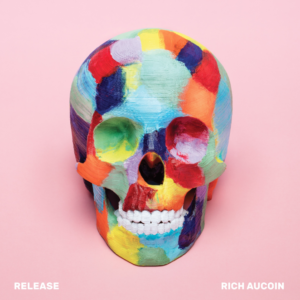 Today, Rich Aucoin shares the video for his latest single “The Mind” via PASTE, lifted from his anticipated third full-length album Release slated to drop on May 17 via Haven Sounds. “The Mind” sees Aucoin channel his electronic music production skills in full force as this pulsating instrumental track manages to create an emotional flow of sounds that is sure to provoke a roaring response from any listener. As this slow building track progresses, a new layer is added after each section, culminating in the explosive and euphoric finale. Textured soundscapes and ethereal vocal samples ensures this track as a staple of Release as Rich Aucoin proves there’s no genre he can’t shine in. In “The Mind” music video, the viewer follows a figure covered in a metallic blanket of sorts (similar to a space blanket) as this unearthly image strides on a sunset beach while being subjected to nature’s elements. Produced by Aucoin and drummer Joel Waddell, Release was inspired by a wide range of music such as David Bowie, Holly Herndon, Fatboy Slim, Björk, John Lennon, Future Islands, Caribou and Chic just to name a few. These influences are evident in his music, as his diverse sound could be compared to a mix of MGMT, Beck, Arcade Fire, Spoon, and M83 all the while still maintaining his own unique blend of organic and synthetic instrumentation. His third album, Release, sees Aucoin grapple with the concept of mortality by using Alice in Wonderland (1951) as a metaphor for the journey. Release can be played as alternate soundtrack along to the film similar to Aucoin’s earlier LP Ephemeral and The Little Prince. Aucoin’s music has seen acclaim across the board with previous releases, We’re All Dying To Live and Ephemeral, long-listed for the Polaris Music Prize. The music video for “Brian Wilson is A.L.I.V.E.” won the Prism Prize, which he’s also been shortlisted for this year for “The Middle”. Nominated for ten East Coast Music Awards including Album, Song, and Fan Choice Entertainer of the Year, with more than 2 million streams, Rich Aucoin has built a reputation for his energetic live shows performing his music written in sync to old movies in the same manner as Pink Floyd’s Dark Side of The Moon with The Wizard of Oz. Using projections to these films, he has brought his interactive performance to stages at Osheaga, The Great Escape, Les Eurockéennes, Les Vielles Charrues, Berlin Music Festival, Montreal International Jazz Festival, Hangout Music Festival, Art Basel Miami, Luminato Art Festival, Iceland Airwaves, SXSW, Pop Montreal and more. Born, raised, and currently based in Halifax, Rich Aucoin has been fully immersed in music ever since he can remember, learning how to play almost any instrument he could get his hands on while also teaching himself production and home-recording. A philanthropist at heart, Aucoin has raised money for several charities with his music. He has cycled coast to coast twice for both Childhood Cancer Canada and The Canadian Mental Health Association/Mental Health America; cycling to each show. He has also crossed Canada for the Canadian Heart & Stroke Foundation running a series of half-marathons.